The Pin Seekers G.O.L.F. (Golf Opportunity Leadership Fellowship) Club began as a way for a small group of friends to catch up and enjoy the commonality of being black golfers together. They started with a group of eight on day one; after a year, the group swelled to 31, with golfers aged 17 to 64 and 20 guys under 40. The second year, the Pin Seekers’ hit around just over 50 in attendance, with 85% minority filled. Co-founded by golfers Charlie Whitfield and LeRoy Nard, Pin Seekers president, the group represents the second minority golf group in the city, right behind the Par-Tee Golf Club, that’s been in existence for over 50 years. Known for its scholarship raising, the Par-Tee Club has given over $250,000 to minority students. 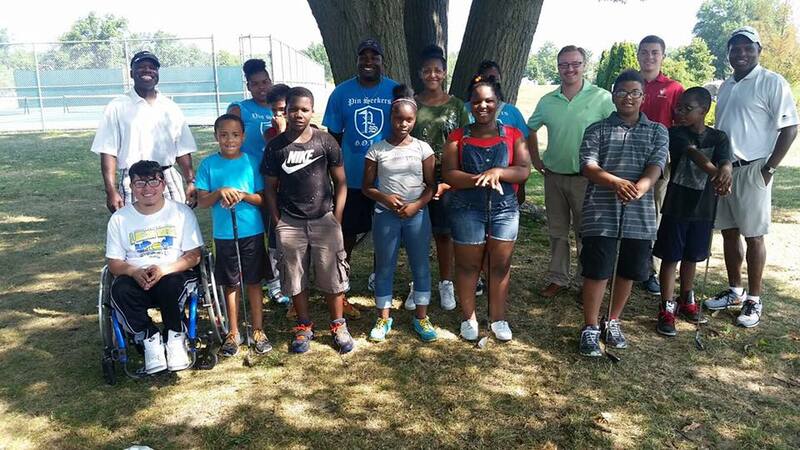 In addition to a younger field of golfers, what distinguishes the Pin Seekers is their focus on community outreach, introducing children to golf, “a hidden jewel in the community,” Nard said, through their youth academy, now five years old. Tiger Words and his reign as golf’s greatest of all time and most visible ambassador was unfortunately cut short and limited to the early 2000s (he’s making a comeback so watch out). Nard and the Pin Seekers see their role as not just being fans but real-life examples for minority youth, for African-American kids. Not only do black folks play golf; they will teach you how. For Nard, the need to teach and represent was rooted in a story when he was eight years old and walked away from golf. He was playing in a golf tournament, the only African-American competing, and incurred a penalty for a rule he didn’t know about, dropping his position from first to third place. The two white players ahead of Nard cracked some jokes about the error and embarrassed the young player, to the point where he was more than cool with just walking away. His father and uncles were members of the Par-Tee Golf Club, so Nard was plenty exposed to the game. But he didn’t pick up a club for another thirty-five years. A small, rotating group of Pin Seekers coach the youths at the academy. Donated equipment is distributed to the players but usually by graduation day, all of the kids will be given their own set of clubs. The second year increase in the academy’s enrollment necessitated the splitting of the summer camp, held at McMillen Park, into a second winter camp (starting in March), held at McMillen’s indoor training facility. 122 kids total have graduated from the youth academy in five years. “You’d be surprised at how raw a talent some of these kids who are,” said Pin Seekers Vice-President Donny Young. “[Some of] these high schools don’t even have enough kids to field a team,” he added and noted the very real possibility of scholarships available for African-American high school golfers in a community that isn’t necessarily flush with black golfers. The energy and atmosphere of competition changes how you think and play the game, Nard said. The group sees that disposition shift in their young charges and definitely within the Pin Seekers themselves, as the competitive environment produces top spot finishes when the members compete in tournaments outside of their own.